Roof replacement is sometimes a necessary expense for your business if your employees, customers, and products are in danger of being injured in a collapse. However, this service comes with a high price tag, so you want to make sure that you can save some money while still receiving a quality job. Fortunately, there are some measures you can take to get the best deal on your roof replacement. Typically, roofing companies are busier in the late summer and early fall, and that demand causes costs to rise and wait times to skyrocket. At any other time of the year, the rainy season has passed and temperatures are much lower, so roof replacement services aren’t in such high demand. Which makes this exactly the time of year you should make the call. Keep in mind that prices will begin to rise shortly before the peak season. Be sure to order services and materials well before that time to guarantee the lowest prices. Your company should also be experiencing a slow-down during this time of year, so you won’t lose as much business during the late fall/early winter months as you would in mid-June. There are a few ways that you can acquire discounts on materials and services. One method is to ask your roofing specialist if any of the materials in your old roof can be reused instead of scrapped. Professional roofers will be able to assess the level of damage to existing materials and let you know if they are in good enough condition to be used in the replacement. Roofers will also occasionally have coupons up for grabs in print media, online, or businesses that have used their services in the past. If the company you wish to hire doesn’t currently offer any deals, you can try negotiating on the price – you never know how much you can save if you don’t ask. Plan ahead by having your building inspected upon purchase. That way, you will have a clear picture of how long your roof will last and whether or not it is in need of major repairs. Once the time comes for the roof to be replaced, don’t wait – get it done as soon as possible. Even if your roof is still seemingly holding together, you don’t want to be caught with exorbitant costs if it fails and you have to have a last second replacement performed. This mistake could cost you time, money, and even lives if you’re not proactive with your roof. Different roofing companies have different rates, services, and quality of service, so save money on a replacement by shopping around. Ask for quotes from different roofing companies, look up the prices of their materials, and compare the types of services that each company offers. If you know other business owners who have contracted these companies in the past, ask for an honest opinion of their work. Then, when you’ve gathered all this information, make a list of each of these categories and weigh the pros and cons for yourself. In the end, you should have the perfect company to suit your business’s needs and budget. While shopping for discounts may save you tons of money, make sure the discounted materials are still high quality. There are cheap materials out there that will save you money in the short-term, but cost you more when it prematurely breaks down. Also, consider these facts when thinking of energy-saving roofs. While the materials themselves might stretch your budget to its limits, you’ll save a fortune on utility costs. Roof replacement is an expensive job, but it can be made more manageable with these tips. Just keep a lookout for opportunities to save while never sacrificing the safety and quality of the roof that shelters your business from the elements. This post was contributed by our friends at Roofing Solutions LLC. 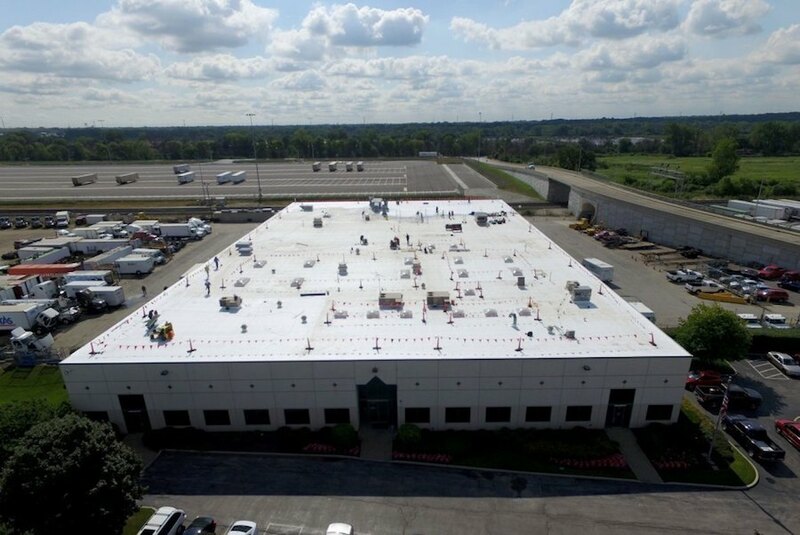 Based in Hickory Hills, IL and serving the greater Chicago and Northern Illinois area since 1992, Roofing Solutions LLC is a commercial and industrial roofing contractor specializing in re-roofing projects and roof repairs to existing flat structures. For more information or to inquire about their services, visit www.roofingsolutionsllc.com.